Property Details: 3 Bedroom, 2 Bathroom Vacation Rental, sleeps up to 10. Florida Vacation condo rental, beach resort home in Perdido Key. This is an amazing Gulf front unit. It runs parallel to the Gulf so you can sit on either of the two balconies and look directly out to the beautiful blue Gulf of Mexico and the white quartz sand. It's Located in the heart of Perdido Key. This is a beautifully constructed 6 Unit Townhome on the Gulf with amazing views. The unit is custom decorated with nice furnishings and flat screens in every room too You will enjoy all the great features of this gulf front town home. It's easy access with your personal garage and walk in entry. There's plenty of room for your family; there are 3 bedrooms and 3 additional pull out couches if you need them.-- Maximum 10 people. 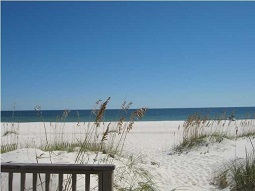 Beach Front Vacation Condo Rental in Perdido Key FL..